Ten years ago, I wrote this blog about my alter-ego, my other persona; what was - and still is - my other name in the skating world. 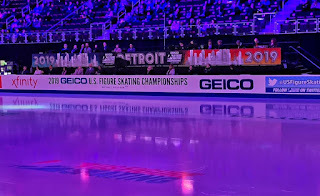 I had cause to revisit this last week at the US National Figure Skating Championships in Detroit. It got me thinking. As you know, my son is no longer competing. However, he had a lot to do, both on and off the ice, since Detroit has been his home-away-from-home for 10 years now. 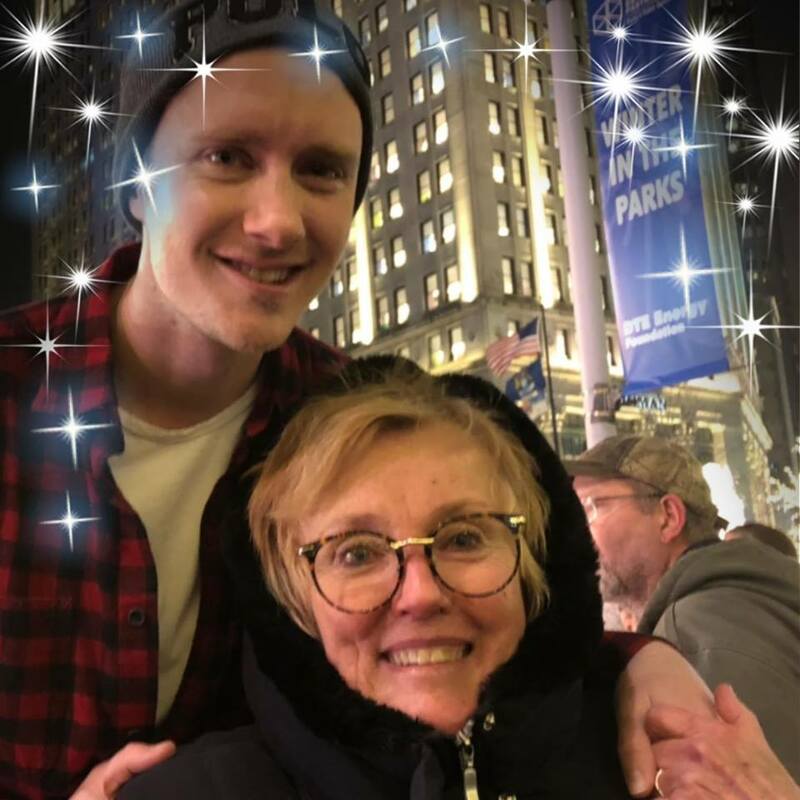 When I couldn't be with him, I found myself watching him on the Jumbotron, at the Ice Desk, and also on the ice during Opening and Closing Ceremonies, as well as at a Scott Hamilton "Skate to Eliminate Cancer" event held outdoors at Campus Martius park in the heart of downtown. 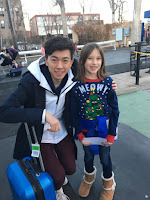 I went to Nationals, not only to spend a little bit of time with him, but to be with my skating friends for our annual "family reunion." So, after all these years, and all but one Nationals since 2003, I'm fairly well-known around the concourse, in restaurants, and sometimes in the ladies room lines. 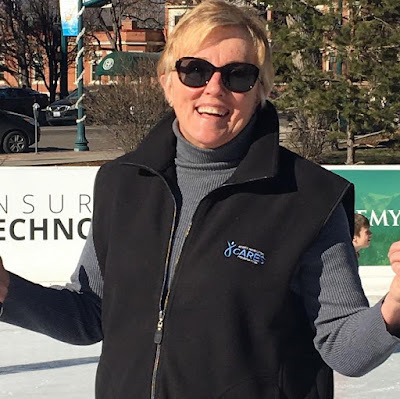 However in our skating world, I'm not always known as Allison Scott, the now-retired PR professional, blogger, US Figure Skating volunteer for Friends of Figure Skating and Memorial Fund events and 29 year skate parent. In this circle of friends and fans, I still take on my other identity. Like Clark Kent goes into a phone booth, turns around twice and comes out dressed as Superman ready to take on the world, I walk into an arena, turn around twice(usually because I've immediately lost the people I came in with) and become "Jeremy's mom." 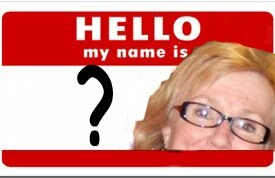 People I've known for years often times can't remember my given name. I get hugs and the first question is "How's your son? Is he here?" The second thing is usually an enthusiastic - and occasionally awkward - introduction to friends. "I'd like you to meet my friend Jeremy's mom." I then have to say something like, "Hi, I'm Allison Scott. So nice to meet you." I bring this up because I have been around a long time, and I have had a fulfilling professional career in public relations. But what concerns me is that I see so many parents, whether they work outside or as a stay-at-home parent, lose their own identity along the way in this sport. It's always wonderful to be identified with your child, and that recognition as a parent of your skater is -hopefully - positive. But don't let it be the only thing that defines you. There is a saying by Horace Greeley that goes, "Fame is a vapor, popularity is an accident, riches take wings. Only one thing endures and that is character." Make sure you remember who you are. 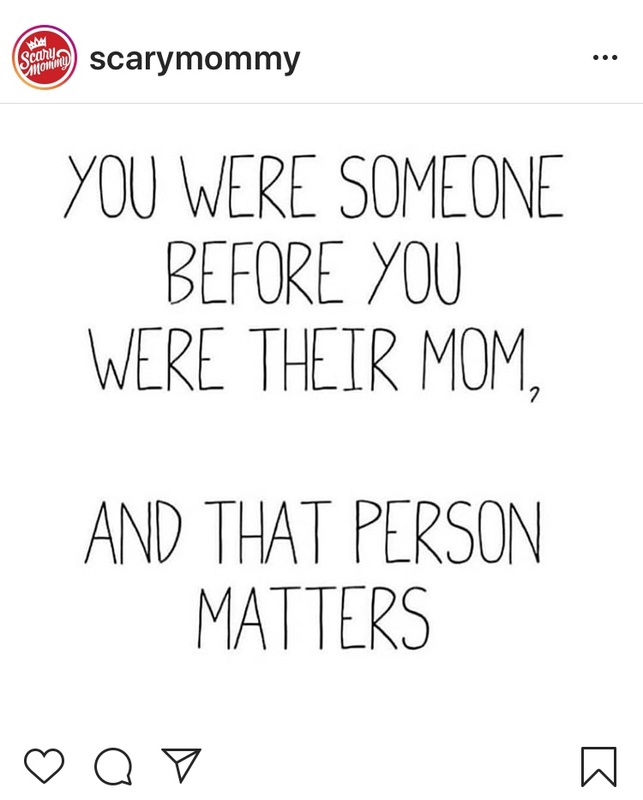 Your kids will always remember who you are. Between my last post and this one, I managed to have Christmas and New Year's all in one day with almost all my family. Oh, and I also retired. There's that, too. 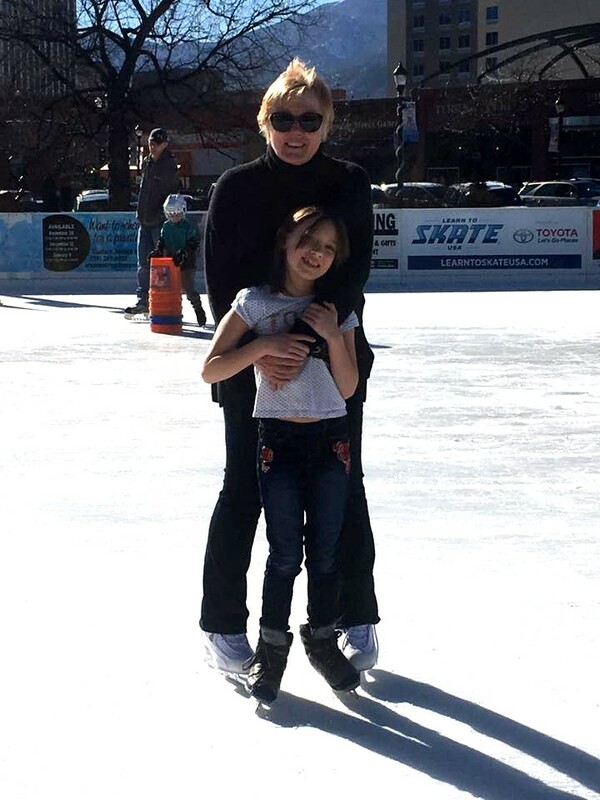 One day last week, when the weather was lovely and the sun warm, I took our 8 year old granddaughter to Skate at the Park. She had only been on skates once before, and that was indoors. Being the life-enthusiast that she is, getting out of the house and to the rink was a breeze. Sweater weather made things much easier. A relatively decent pair of rental skates added to the excitement - for about 30 seconds. You know from my previous two Facing Your Fears posts that I was just getting back on the ice myself. Inching up a slippery ramp and then helping my granddaughter onto the ice was a fear I hadn't expected. I was scared of falling, or falling on her. "NANA!! HOLD ON TO ME! I'M SCARED! I CAN'T DOOOOO THIS!" "Let's try using the buckets." With temperatures again pushing 50 degrees, the ice was rapidly softening and rutting. That made the edges by the rail something akin to skating on a severe case of acne. Raised bumps and uneven edges were everywhere, making the task of holding on to her while she held on to the buckets quite the challenge. I suppressed my inner Skate Mom and didn't even try to give anything resembling "instruction" because it was not going to go well if I did - either for her, or for me. We set some goals of going from one panel to the next without holding on. After a turn around the postage-sized rink, that started to seem like a doable thing. One panel turned into two, then three. But things really got better when my granddaughter made a friend named Olivia. Olivia was also using a barrel, but she was already stepping away and was trying things on her own. She and my granddaughter started venturing out to the center of the ice with the barrels. The squealing changed from terror to joy as the two of them figured it all out. Before I knew it, they were both racing around the ice at an amazing clip. The operative phrase went from "Hold on to me!" 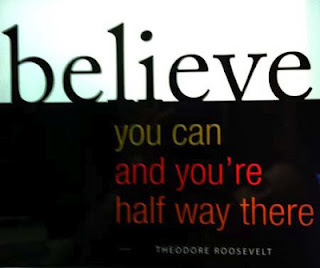 to "I can do it myself. Watch!" 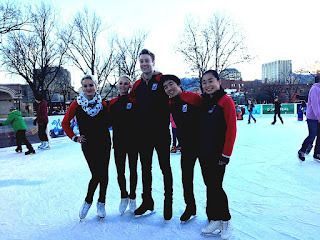 It was "Skate With Team USA" that afternoon, so we stopped for lunch, went back to the rink, got our skates on again and tried to find a centimeter of ice that wasn't taken up by all the people who had come out to skate with the athletes. At that point, I was exhausted. I had been on my skates for nearly four solid hours. I also had no intention of getting on the ice with the Team members, all of whom I knew. That would have been taking the Skate Mom thing to an entirely new and awkward level. At the end of the day, exhausted and exhilarated, we headed home. My granddaughter faced her fears and learned that anything is possible if you are willing to work for it. Me? I managed to do some very tentative crossovers for the first time in five years. At home by the fireplace that night, with hot cocoa in hand, we both agreed that we had accomplished much that day in the park, under the sun. And we agreed that it was just the beginning. It had been a couple of weeks from the time I'd braved the ice. My first foray was the most difficult. It had been a long time coming, a lot of pain and a few more years had floated under the bridge. I chronicled that event in my last blog, and then life started moving quickly as I found myself facing my immanent retirement. Skating outdoors was the next step in my three-part return to achieving my "Bucket List" dream, but the weather had not been particularly conducive to doing that, and frankly I was not sure exactly where to go. I was looking on line to see about outdoor venues in my area when Skating at the Park came up. Every winter for a few months, the city constructs an outdoor venue in a city park right in the heart of downtown. The location has its upside - and some downsides - but it is convenient, and the view of the mountains is lovely, particularly in the evening with the holiday lights shining. This would be the perfect place to start, but all my close group of adult friends who skate live in other places. I didn't want to go by myself, so I figured I'd wait and perhaps go inside one more time just to make sure I'd be okay. "It's a beautiful day! Let's go skating at the park.I can meet at 11am." "I can't do 11, but I can meet you at 1," I replied. "I have a couple of things I have to do first. Text me about 12:30 and we'll go." I finished my errands early and put everything away. Suddenly, a wave of nervous adrenaline swept over me. I started getting dressed. Nothing seemed right. Everything was either too heavy or too light. I couldn't find my gloves. Was I going to need a hat? I didn't want to wear jeans because what if I fell? I'd be soaked. There's no place to change. And so it went - until the phone rang. Then everything fell into place and off I went. I had only met Lori one time before, a few years back when Adult Sectionals were held here. She is a competitive adult skater and very active in that wonderful world of men and women who are totally dedicated to the excruciatingly hard work, dedication, camaraderie - and fun - of competing in this sport as an adult. When I came up to the park, I recognized her right away from her photos . 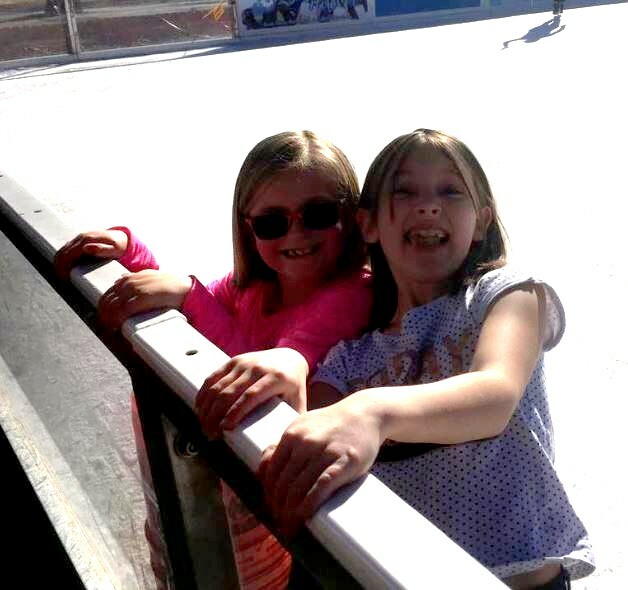 We chatted, paid our admission, headed to the benches and put on our skates. We talked about fears; about what both of us were facing in taking this step back on the ice. I wasn't aware until that moment about Lori's battle with injuries and surgery, what she had faced, and her own questions about getting back after some time off. We inched our way up the ramp, dodging young children and some very excited foreign visitors who were obviously on the ice for the first time. We both slid our blades on what could barely be called ice because it was a perfect blue sky day, and the 50 degree temperature at 1 in the afternoon had turned the extremely small and overcrowded surface into a giant, rutted Slurpy. I honestly thought I'd only last about 30 minutes. I think Lori felt the same. But, we moved (I'd hardly call it skating) around in circles, maneuvering around the masses, and talking about how difficult it is to come back to the ice as an adult after you've had life-changing events. Thirty minutes turned into more than an hour. 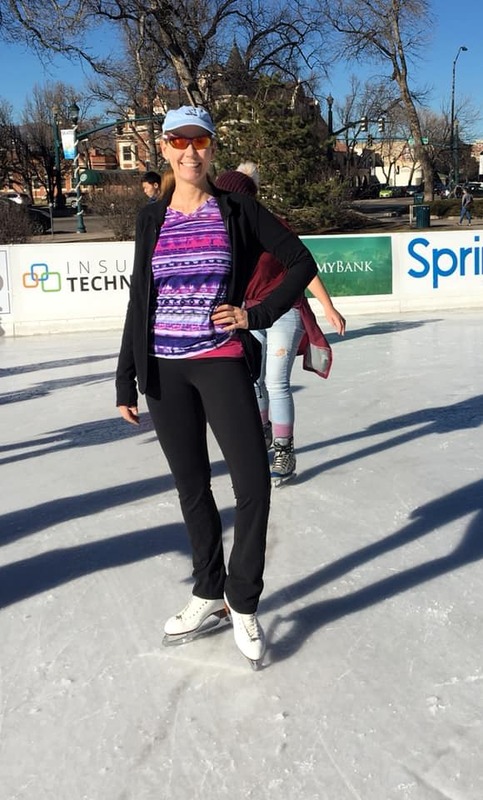 In that time, we both laughed, gained confidence, and we gained a deeper understanding of one another and what it took for both of us to meet on that sunny day in the park, put on our skates and simply get started again. Each in our own way, that simple step was a huge victory for both of us. Friday, I completed my last full day at work. 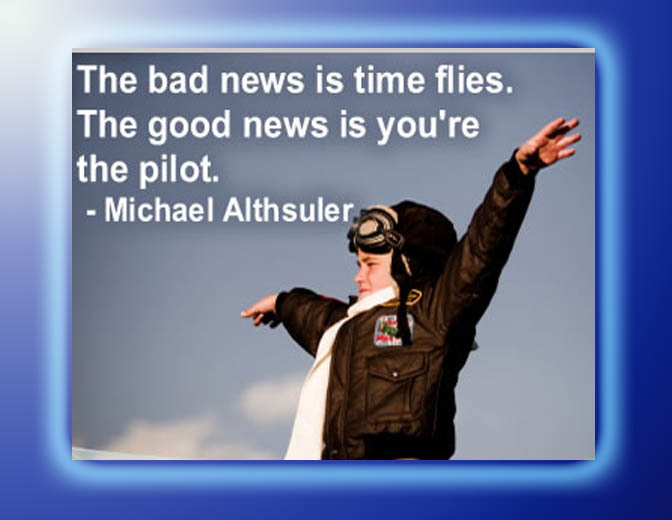 I have two more half-days before I officially retire after working for more than 47 years in my chosen profession. I have struggled with that for the past few months. I've panicked about being on fixed income, not knowing what was next for me or what I would do with my life after work. However, that one day back outside, talking with a friend, skating around in a slushy circle with the sun shining and the mountains peering over the tops of the buildings downtown, made me realize that somehow everything was going to be okay. I had taken another step forward and achieved another goal, and there would me many more. That was my "Ah Ha" moment, and it was truly a breath of fresh air. Recently, I got back on skates again. It had been nearly four years since I was on the ice. Arthritis and bunions made it difficult to find comfortable shoes, and impossible for me to get my foot into my old skates, let alone my work shoes. Finally, the pain got so bad that I opted for surgery on my left foot to relieve the pressure. Seven screws, a pin and a plate later, I found myself on a long road to recovery, still with pain and now with toes that didn't bend. First there was the scooter, then crutches and finally a walking boot for eight weeks. 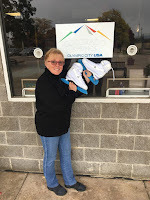 After that, there was the issue of finding shoes that I could wear, getting rid of a closet full that had outlived any semblance of usefulness, and experimenting with varying pads, splints and all manner of contraptions on my feet in order to find the combination that would allow me to walk again pain free. That took nearly two years. Me at Rockefeller Center 1952. One of the driving forces behind succeeding was to actually get back on the ice. I love skating outdoors. I do not like skating in circles around a rink since I spent a better portion of 29 years sitting and watching those infinitely more talented than I transform those surfaces into magical places of athleticism and wonder. I simply wanted to be on a frozen pond, surrounded by nature and thankful for the absolute joy that feeling brings. I found a pair of skates called SofTech by Jackson Ultima. They are purely recreational by design. They are functional, but the most important thing about them is that I could get my non-bending toes into the boots. After a conversation with my Jackson rep, the same one who takes care of my son's skates, we concluded that I would 1) not be doing triple axels, and 2) probably not be attempting death spirals (at least not on purpose - or with a partner). This made my choice the best one for what I did want to accomplish: Getting back on the ice just after my 70th birthday. The skates came in. They fit like a glove. Now, all I had to do was get back to a safe place to test them out. Nothing outside was open - or even frozen - when my skates were delivered. However, I knew I had to get back on the ice. I had to face my fears of being out of shape, feeling my age and, frankly, being afraid of falling and breaking something. All the "What If's" flooded my brain like a Zamboni laying down a new surface after a particularly rough elite practice session. 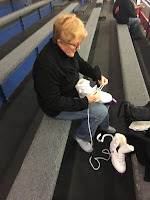 I gritted my teeth, grabbed my skates, looked up a public session time at a local municipal rink, dragged my husband along "just in case" something happened, put on my warm socks, my turtleneck, jeans and a fleece jacket, and off we went. My blood pressure was probably through the roof, but I was going to get on the ice, even if I had to hug the boards. Which is exactly what I did. That first step back was anything but secure. My mind was saying, "Come on. You've skated all your life. You were pretty good for a recreational skater. You passed basic Moves. You passed preliminary dance tests. You did figures for years. 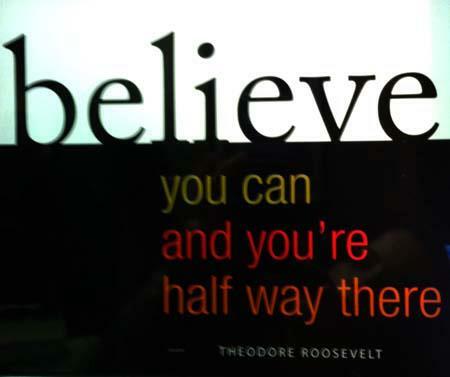 You've GOT this." My body was like. "WHAT THE HECK ARE YOU DOING??!!! ARE YOU NUTS??? This is NOT like riding a bicycle. 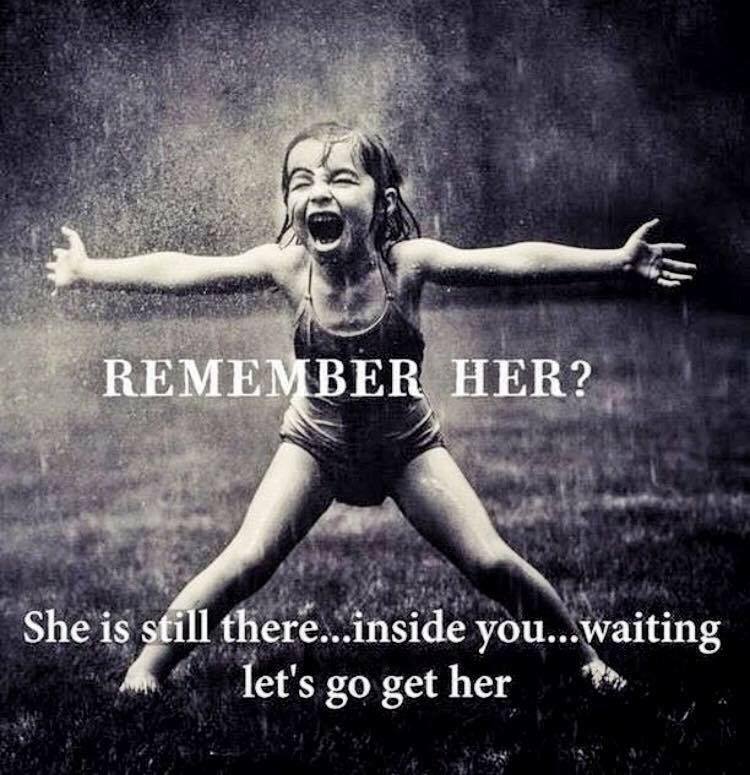 Remember the last time you did that? You hit a curb and fell off, bashed your elbow and cut your knees open. This is NOT a good idea! You're out of shape after your surgery. You fell cross-country skiing in Idaho with your daughter last November and twisted your back. You just turned SEVENTY! Go home, have a glass of wine." around while my husband did some video which, thankfully, did not go viral. Second time around, I felt a bit more brave. I let go, but I stayed within reach of my safety net. By the third time, I was actually doing some stroking. Not stoking like a pro, but at least I wasn't walking. Stopping safely was still eluding me so I coasted into the boards by the door, walked onto the mats, put on my guards and considered it a win. I lasted about 30 minutes total, but the point is that I did it. I felt okay. I didn't fall. I was tired but I was grateful that I didn't take the easy way out. I bring this up now because I'm facing retirement at the end of December. While my body is saying it's the right decision, this time my mind is like, "WHAT THE HECK ARE YOU DOING??!!! ARE YOU NUTS??? This is not like riding a bicycle..." and you know the rest. So, I'm taking on retirement the same way I took on skating. Mind over matter. 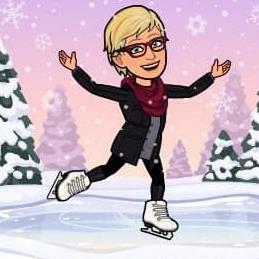 Because now time matters, and I have a lot of things I want to do with my life - including skating outside in nature, unafraid and in awe. That's how life should be lived. I know it has been a while - actually March - since I posted my thoughts. Frankly, I haven't had much to say. However, events of the past few months have made me think a lot about friends and family- ones who are here, ones who have left us, and new friends I've made who are just starting their journey into this strange life. Stay tuned. The door is opening again and I will have a post shortly. 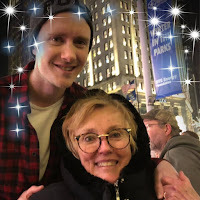 If you have followed my blogs for any length of time - say, anywhere between 2009 and just a few weeks ago - you know that I try to use humor to talk about the "universal truths" of skating framed in my perspective and through our experiences over the past 29 or so years. Humor is important in keeping sanity, and in getting a message across. It has been my savior - and my shield - for a long time. This past weekend, however, I had something happen that I wasn't expecting. I had a bit of a breakdown. Actually, it wasn't just a "bit," it was a full-blown I-don't-know-what's-going-on-or-what's-wrong-with-me breakdown/meltdown, whatever one chooses to call it. Being - well - me, I had to try and figure it out. 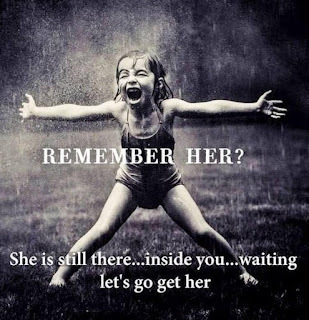 In doing so, I came to the realization that what we don't talk about - except in whispers to ourselves amid tears at 2AM - is what happens to us when the stress of however many years, is gone. Pile on top of that all the things that happen at work, at home, with family members, with finances, and what is left is a very large bucket filled with a mixture of anxiety, uncertainty - nothingness, and everything-ness. For me, things went from survival to feeling like the story about Lemmings and the cliff. However, this cliff was atop Mount Everest. I'm not quite sure how I made it to the summit, but now I was looking down from 29, 029 feet with no oxygen and no clear egress. Apparently, I packed a lifetime of emotionally gunnysacking over the past decade or two, and the weight was crushing. My mother passed away in October leaving us all with volumes of papers and a warehouse full of collected "stuff" to sort through. Several weeks before she passed, I was crushed with finishing a book, as both an editor and contributor, one that exacted a year-and-a half toll out of my life. The week before, our daughter came home to see her. The day before, our son had MOHS surgery for basal cell carcinomas on his head. He made it home hours before she left us. A few months after that, I gave my work a year's notice to my retirement at the end of this year. With the end of the quadrennial and the naming of the Olympic team, work changed for our skater and many of the shows he had the great fortune to do for the past eight years evaporated, going to the next generation of skaters who had now earned their way. Everything I had known, for the 69 years of my life, and the past 29 years of my life on the edge of skating, was either drastically changing - or gone. Disquieting does not adequately describe that realization. Terrifying may be more accurate. 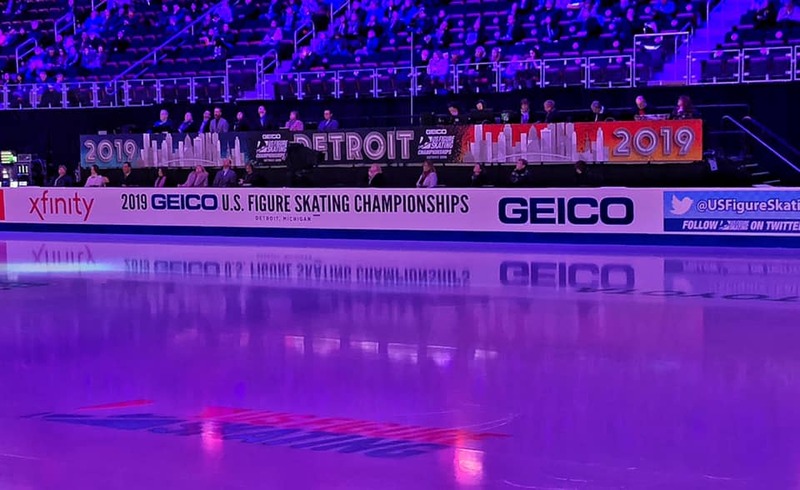 There has been a lot of conversation about helping skaters who come to the end of their competitive careers without a goal, or even a plan. It is a problem that is being examined and, hopefully, addressed. But no one is talking about us. I suppose it is because, as parents, it is expected. We are the "skating moms" and "skate dads" who stoically sat on metal bleachers, who quietly (and sometimes not-so-quietly) did our jobs so our kids could reach their individual levels of success. This competition thing - this sport - takes its toll on us, too. And when it is over, we are faced with different lives because of it. We are older. 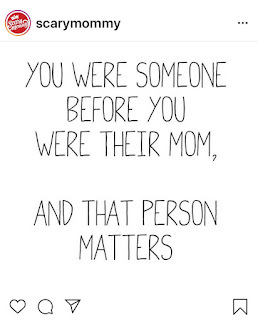 For the most part, our kids are grown and gone. 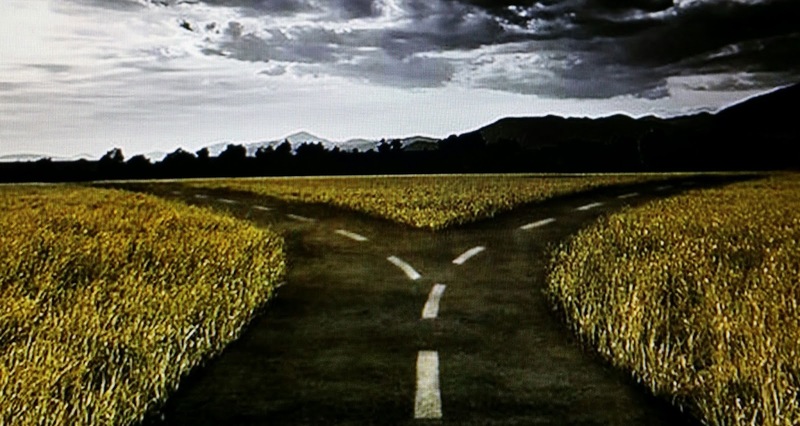 For many, our families are divided - either by distance or by choice. 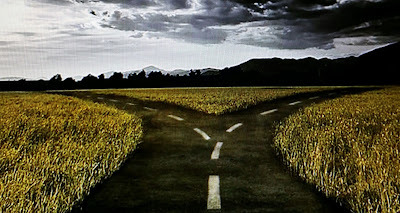 We are faced with that universal question of "What do I do now?" The answer to the question is as individual as the people who have gone through it and are now seeking the answer to what we do. It is not as simple as just moving on. That gunnysack has a lot in it that needs to be sorted through, and purged. So, there I was over the weekend, not knowing what was wrong; crying for no seeming reason; unable to verbalize out loud the flood of emotions that were overwhelming me. In whispers, I spoke to my husband, who listened, understood and did not think I was falling off the cliff, just teetering on the edge. I'm fully aware that not everyone has that kind of support, and I could not be more grateful. However, all of you who have children who are athletes, or prodigies that required nurturing - and lives that we have either put on hold or ones that have gotten in the way- there will come a time, sooner or later, when you will reach that that point. It is our rite of passage, I suppose. The only constant is change. The question is how to prepare for it - or if you even can. I don't normally step away from my admittedly self-ordained role as one who attempts to chronicle parental skating life with a sense of humor, but I need to take a moment to speak to media covering the Olympics - some, perhaps, for the first time. Please remember this: There are NO ex-Olympians (unless they had their medals removed for cheating); there are NO former Olympians. The athletes that represent their countries in all sports - winter and summer - are forever always Olympians. Like generals who lead their troops, these athletes earned their stripes. 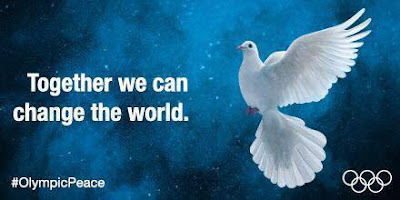 They earned the right to take the hopes and dreams of their countries with them into "battle" on the world's biggest stage. Some are victorious; some are not. They are all heroes. And NONE who served so well deserve the moniker of "former" or "ex". So, as we head into Olympics in PyeongChang, honor those Olympians who came before; who stepped out, and stepped up, to serve proudly. Please speak and write with respect about what they went through to earn their right to represent. They serve an important advisory role to a new generation of leaders who are trained, prepared and wear their country's colors with great pride. The Olympic family is just that - family. Give them credit for going where most will never tread. They deserve that from you. They deserve that from all of us.